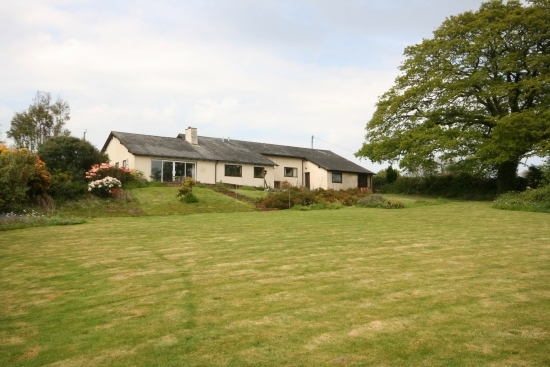 Hunters Field is a very spacious detached bungalow situated in a rural location about four miles from Dartmouth and set in gardens and grounds of approximately 3 acres. There are wonderful far reaching southerly views over the beautiful rolling South Hams countryside from the property and grounds. The accommodation, which would benefit from some updating also has plenty of space for extending. It comprises a well-proportioned living room with sliding glazed doors opening onto a full-length sun terrace, a study, good size kitchen/breakfast room, utility room and four bedrooms, one of which has an en-suite bathroom. A large garage provides parking for four vehicles and there is also an additional garage/store and ample driveway parking.